Prusa RepRap seems to be functioning well under optimized settings. Use with experience on the machine and/or come to 3D Thursdays (7-10pm) to learn how it works! Use 3mm PLA only. Make sure temp is set at 190 (for clear PLA) and the above settings are loaded. Remember, respect the 3D printer, and you will get desired results. Romy - this is REALLY OLD. Like from 2008 old. Where were you in 2008? Is that when your okcupid date was born? We have to update this. RepRap is short for Replicating Rapid-prototyper. 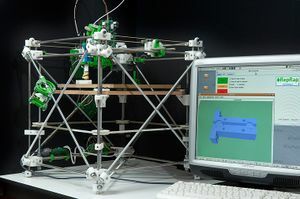 It is the practical self-copying 3D printer shown on the right - a self-replicating machine. This 3D printer builds the parts up in layers of plastic. This technology already exists, but the cheapest commercial machine would cost you about €30,000. And it isn't even designed so that it can make itself. So what the RepRap team are doing is to develop and to give away the designs for a much cheaper machine with the novel capability of being able to self-copy (material costs are about €500). 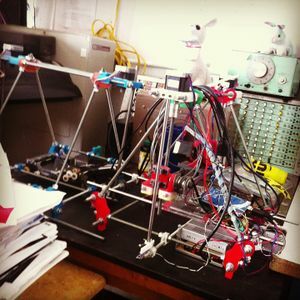 The RepRap project is a bit optimistic in their description -- their "self-replicating" machine is capable of printing all of the non-commodity parts of their machine, but still needs stepper motors, steel rods, screws, nuts, control circuitry, and of course a human to assemble the pieces. http://www.reprap.org/bin/view/Main/McWire_Cartesian_Bot_1_2 - easy to follow instructions for a kit version of reprap. Some parts of RepRap can be developed independently. In particular, the Extruder "print head" is pretty much independent of the chassis mechanism, and looks like a fun project. Might want to consider other print mechanisms too; this one may be specific to a few of the thermoplastics. All the electronics have been ordered! This is most of the parts for two sets of RepRap electronics. Nut 1/2"-13 Thread Size, 3/4"
Nut 5/16"-18 Thread Size, 1/2"
5/16" Size, 11/32" ID, 11/16"
Steel Two-Hole Clamp for 11/16"
This page was last edited on 21 January 2018, at 06:22.